A traditional cottage of character prominently set in the centre of Gunnerside village in the heart of the Dale, providing manageable three-bedroom accommodation on three floors, retaining beamed ceilings, a wealth of original features and certainly warranting viewing. Greystones is an ideal main or second home, currently operating with successful holiday lettings. Living Room: - 11'5'' x 13'9'' (3.48m x 4.19m) - A good-size living room with window to the front, marble surround fireplace with inset multi-fuel stove, feature panelling, beamed and boarded ceiling, understairs cupboard with light, alcove shelving and stripped wood flooring. Kitchen: - 15'8'' x 7'8'' (4.78m x 2.34m) - Fitted with range of units in beech finish with worksurfaces, sink unit, tiled surrounds, built-in fridge, single oven and ceramic hob, boarded ceiling and panelled door to the side. Utility: - 4'11'' x 8'8'' (1.50m x 2.64m) - With window to the side. Wc/Utility: - 5'8'' x 8'9'' (1.73m x 2.67m) - A useful utility area with sink unit, power points, plumbing points for washing machine, electric heater and WC. Bedroom 1: - 11'5'' x 13'8'' (3.48m x 4.17m) - Having window to the front, cast-iron feature fireplace, walk-in cupboard with light, and storage heater. 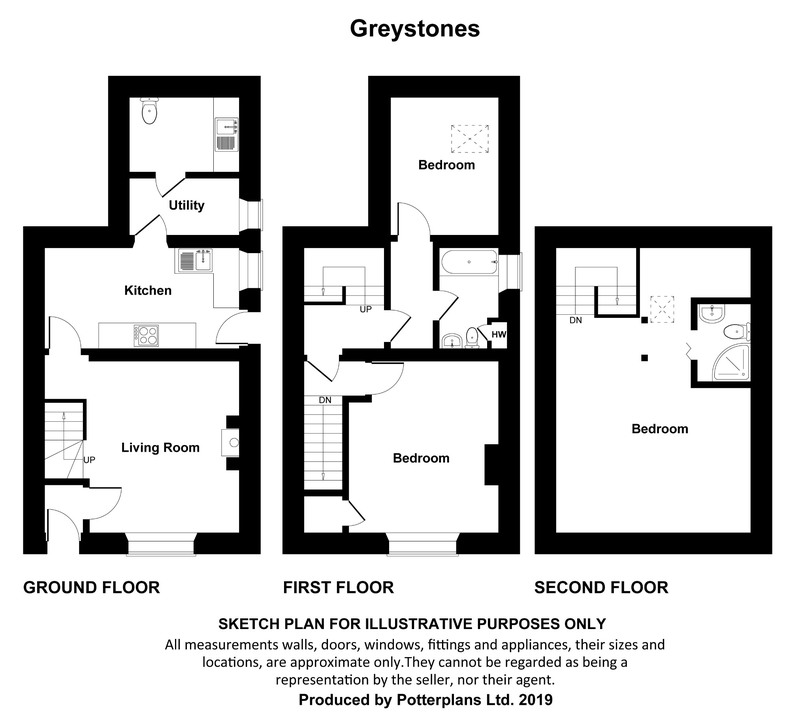 Bathroom/Wc: - 6'5'' x 7'8'' (1.96m x 2.34m) - Having panelled bath with shower attachment, wash-hand basin, WC, airing cupboard, stripped wood flooring and panelled surrounds. Bedroom 2: - 8'1'' x 10'9'' (2.46m x 3.28m) - An additional bedroom to the rear with Velux style roof light and storage heater. En-Suite Shower/Wc: - Having shower cubicle with electric shower, wash-hand basin (cold water only), WC and tiled surrounds. Front Forecourt: - A flagged raised forecourt terrace with neat stone walling, external lamp and the original feature post box. Gravelled area to the side, potentially for parking, again with external lamp. Store/Coal Shed: - With light and power. Note: - Some contents available by separate negotiation.